Arrived at the air charter office to meet Neil who told me that maybe not going to Harare after all today but would go tomorrow come what may. But after checking him again a bit later he confirmed that we would go around 1300. At about 1330 we took off with Johan in Neil’s twin-engined small plane, a Cessna I think. It was full of stuff since he was moving his household effects: all the wing pods and the nose cone were stuffed to capacity. As we purposefully gained height I wondered what the whistling noise was and assumed it was from the air-vent at my side, then after a while someone in front noticed that Johan's door latch handle was not properly secured. Neil told him to try to open it a bit and pull it shut but the door couldn’t be closed any tighter. Not able to hear what was going on, it seemed to me that a decision was taken to press on regardless. A minute or so later I realised that over Johan's shoulder I could see a clear inch of sky between the door and the door frame because the latch was obstructing complete closure. Not wishing to appear too worried I tapped Neil on the shoulder and (nonchalantly) whimpered, “Won’t it get a bit cold at 11000 feet?”, indicating the gap at the top of the door, which was invisible to him from his seat. After inserting a couple of investigatory fingertips through the gap to confirm the problem he made a sharp turn for Maun. Here we landed on the airstrip, Johan opened and closed the door and we took off again without ever doing less than approximately 100kph. Wahey – chocks away, Ginger! So an exciting start and the trip was marvellous, through thick cloud – a lot of plunging in to towering white cumulus and popping out into gaps where the sunlit earth could be seen beneath. I’d never done that in a small plane before and found it a bit unnerving at first – like bobsleighing through a tube, with no up or down, ahead or astern - until we punched through one cloud and out the other side into blue sky with the landscape spread out below like the proverbial patchwork quilt, golden autumnal tones and all. Decent. The radar in the plane showed a lot of bad weather ahead and by the time we got to Harare the airport was almost curtained off by low dark thunderclouds and rain was coming down heavily. It was prematurely dark. We landed and taxied to the brand new international terminal - a magnificent sparkling edifice with noone inside. It looked as if the place was being run by only about 2% of the people who were supposed to be there. We had to knock on a closed office door to get an immigration officer to come and man one of the numerous smart new passport control booths ranged across the floorspace like teleportation terminals (that may have explained the skeleton staff). Airports are pretty superficial but to those like me, who can’t miss a cliché, this was a sad testament to the country’s plight – it must be demoralising to work in this sparkling, potentially streamlined and efficient, echoing mausoleum of a place. It’s a genuinely attractive building, a huge improvement on the old terminal, and it would project a wholly positive image if busy. This is probably a bit uncharitable since we had arrived in a private plane. There was a British Airways 777 standing outside which probably had disgorged a huge mob of passengers a few hours before. Neil told us that the 777 has the biggest aircraft engines ever made ..
Immigration and customs is easy when you are one of three travellers in the place, and then it was a case of finding onward transport. 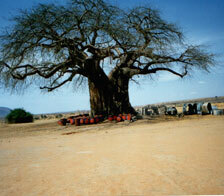 By about 1700 I was in the nearby British Airways office to buy a ticket to Nairobi on the 1100 flight the next day. They weren't able to print my ticket because the printer had been buggered up by a power cut earlier on. There was a display of brochures about the special relationship between Britain and Zimbabwe. Next task: acquire local moolah. Taking a tip from Dave von Adelsburg at the Internet Café in Maun I went to the nearest Forex bureau in the airport atrium thing – there are several of these Forex kiosks, apparently installed in anticipation of crowds of tourists milling about the place baying for local dosh. All the attendants were waving at me from behind their brand new sheets of plate glass to attract me to their booths. I chose the nearest and asked for the rate for Botswana Pula. It said about 9 on the brand new gleaming electronic sign. The nice lady behind the desk said how much do you want so I said 35 and in the end we settled for 30. She said that all the Air Botswana staff changed Pula with her since her rates were the best….. I changed a hundred P and spent half the ZimDs received on a taxi into town. The ride was depressingly familiar – cold, grimy, overcast and pelting rain, with the pedestrians running for cover and the traffic jamming and jostling - it was just like Britain. Eventually we got to the Hotel, my South African emigré taxi driver complaining about the uncharitable drivers in Harare who had not meekly opened their ranks to allow him to cut across three lanes of rush hour traffic within a fifty meter stretch to deposit me kerbside. “These people are too rough – this would never happen in Jo’burg, “ he lamented. “They would just let you through.” As I alighted, I wondered how long he had been away. Just as last time, the doorman, concierge et al were very friendly and helpful – very good service despite the probs. Here the room rate is about 7700 Zim for a single if you are a citizen, or USD 120 if you are a non-citizen. We went through a charade of looking at the room and I offered to pay Pula 150 for the night. That was pushing it a bit, it seemed, and in the end we settled for USD 50. Because I wanted to pay by VISA I had to be charged as a local which meant filling in the registration form with a fake address and ID number, all apparently a normal procedure these days. I felt a bit guilty about my shameless bargaining but then thought that if my offer was unacceptable they would have turned it down. Perhaps they shouldn’t have to put up with it, but it is still a buyer’s market On reflection I realised that what I ended up paying - the ZimDollar citizen price - at fair value is about Pula 300 or USD 50. So it would all be fair and square if the ZimDollar had a proper Ex Rate. Case solved.